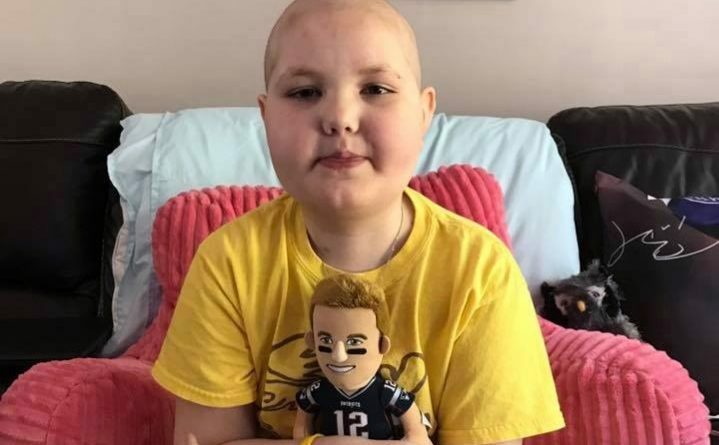 Hailey Steward at home in August 2017 with her Tom Brady doll. Hailey Steward with her mother, Tabaitha Steward, in February 2015, after undergoing three years of treatment for pediatric leukemia. 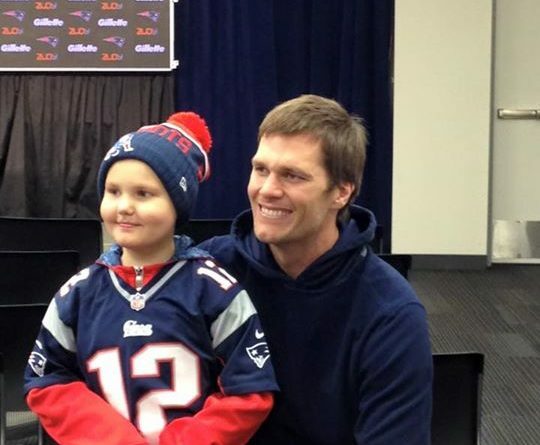 Hailey Steward's Christmas wish came true in 2015 when she got to meet New England Patriots quarterback Tom Brady at Gillette Stadium in Foxborough, Massachusetts. Tabaitha Steward has come to expect the averted eyes and downcast glances when she works to raise awareness about childhood cancer. It’s not a topic many people want to consider, as they stroll through a county fair or other local event and pass one of Steward’s tables. It wasn’t something she considered much herself, before her daughter Hailey was diagnosed with leukemia in October 2012. “Like anything else, unless it hits you, you stop paying attention to it,” Steward, of Bethel, said. Hailey Steward was among more than 700 Maine children diagnosed with cancer between 2003 and 2014, according to new federal data. The numbers provide one of the most comprehensive state-level looks at pediatric cancer rates in recent memory. Maine’s rate of cancer among patients under age 20 was 190.5 per million residents, significantly higher than the national average of 173.7, the U.S. Centers for Disease Control and Prevention report shows. Experts cautioned that the overall numbers are small, which both reassuringly underscores the rarity of childhood cancer and makes the figures challenging to interpret. They don’t know why Maine’s rate exceeds the national average, or what’s driving differences from region to region. The new rates also fall within statistically probable ranges that overlap from state to state, which muddies direct comparisons. Nevada was omitted from the study because it did not meet reporting requirements. Maine has consistently recorded roughly 60 cases of pediatric cancer a year over the last decade and a half, said Dr. Bruce Bates, director of the Maine Center for Disease Control and Prevention. “This is a devastating diagnosis and a devastating influence on patients and families,” he said. The Maine Cancer Registry collects that data from death certificates and insurance claims, but the new federal figures, released in late June, put them into context with other states. The incidence of pediatric cancer was highest in the Northeast, including lymphoma and brain tumors. “It’s something we need to be vigilant on; it’s something we need to track, but to try to figure out what approaches one can take to alter that, the numbers are so small as to make that difficult,” Bates said. Knowing more about geographic variations in childhood cancer could guide states in how best to provide care, particularly in rural states like Maine where many patients must travel for treatment, the U.S. CDC noted. It also could encourage enrollment in clinical trials and spur further study into such variations, the agency said. “The most pressing question is why are there differences in the rates in certain parts of the country?” said Dr. Nadine SantaCruz, a pediatric neuro-oncologist with Eastern Maine Medical Center Pediatric Oncology. If the genetic makeup of the population plays a role, scientists could potentially develop better screening tools to detect cancer earlier, she said. Without those answers, children and their families are left facing a cancer diagnosis as a random event. While cancer rates among adults are similarly high in the Northeast, compared to other regions of the country, much of that is attributed to smoking, obesity and other factors over which patients have some control. Dr. Stanley Chaleff, a pediatric hematologist and oncologist with the Maine Children’s Cancer Program in Scarborough, echoed SantaCruz’s comments, saying most cancers among children involve no known genetic predispositions or environmental influences. Still, he questioned how genes and the environment might contribute, noting that cancer rates tend to be higher among populations, such as Maine’s, with significant heritage from Northern Europe. Maine also must ensure it has adequate access to care and doctors to treat children with cancer, he said. His program, based in Scarborough, and EMMC’s, located in Brewer, are the only two pediatric oncology programs in the state. “Because the rates are higher, we need a little bit more resources for the size of the pediatric population that we have,” he said. That being said, “The happiest day of my life will be if I’m out of a job because there’s no one to take care of,” Chaleff added. Hailey Steward was a patient of the Maine Children’s Cancer Program for several years, upon her diagnosis of B-Cell acute lymphoblastic leukemia. Family doctors originally thought her symptoms indicated a strep infection, but her mother pushed for a blood test that confirmed their worst fears. Hailey went on to undergo more than six years of treatment, spending just six months of that period free of chemotherapy. Despite her own struggles, she thought of others during that time, her mother said. Hailey distributed gift cards to other children at MMC’s Barbara Bush Children’s Hospital in Portland, sliding them under each child’s door, and collected money to purchase iPads for the young patients and refrigerators for their rooms. “I watched our hospital go from having very few kids that were in there for childhood cancer to every room being full,” Tabaitha Steward said. When Hailey heard other children crying, she encouraged them not to be scared and comforted them with her stuffed animals, her mother said. Hailey attracted the support of thousands of people, in her town of Bethel and well beyond, through posts on social media chronicling her battle. Among her fans was the star Patriots quarterback Tom Brady, whom she met in December 2015. After the third time she relapsed in March 2017, Hailey made a video begging the world to save her and other children stricken with cancer. Sitting in the car with her mother after the fateful appointment and wearing a pink winter jacket, she was overtaken by tears as she made her plea for a cure. Hailey Steward died later that year, on Sept. 23, 2017, at the age of 10. 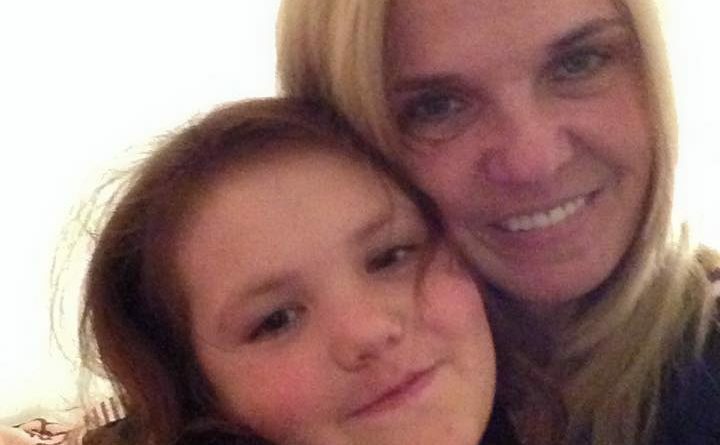 “She wanted us to know more, and learn more, and do more,” her mother said. Tabaitha Steward continues to run a nonprofit called Team Hailey Hugs, which awards grants directly to families living with the financial strain of childhood cancer. She’s also lobbying to create a specialty license plate to benefit childhood cancer awareness. She needs to get 2,000 people to register for one to get the effort off the ground. On Sept. 1, she will host the Maine Goes Gold for Childhood Cancer event in Bethel. The event will feature family-friendly activities, which Hailey requested before her death, after the event’s first year in 2017. While her focus is on helping children and their families, Tabaitha Steward said more research must be funded and conducted into the causes of childhood cancer and the best ways to treat and prevent it. This is the first piece in an ongoing look at the prevalence of cancer in Maine, which is the No. 1 cause of death among adults in the state. If you have an idea for a story contact Jackie Farwell at jfarwell@bangordailynews.com.